One of the most prolific and popular ballets of all time, Giselle tells the story of a peasant girl who descends into madness and ultimately dies of a broken heart after learning that her beloved, Albrecht, is betrothed to someone else. The Wilis, a group of supernatural women who were all betrayed by men when they were alive, target Albrecht for his betrayal. The Wilis and their leader Myrtha are ruthless in their punishment, forcing men to “dance to the death.” But Giselle’s great love for Albrecht leads to her forgiveness of him and ultimately, saves him from the Wilis’ fate. 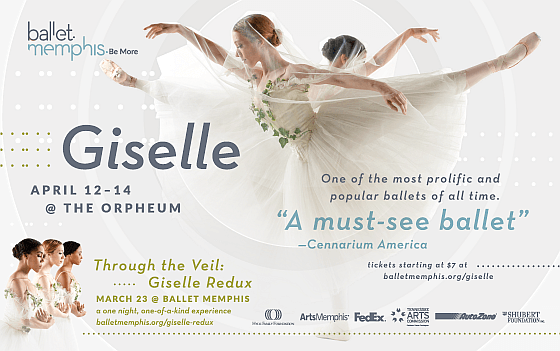 Giselle’s sorrow and her death touch upon very current, poignant human themes of class and gender barriers, forgiveness, and compassion.